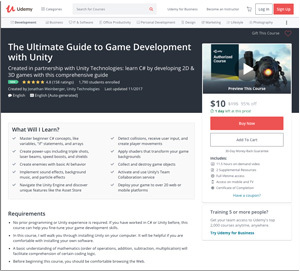 Online learning platform Udemy has partnered with Unity Technologies to create a series of online courses that teach developers how to build interactive 2D and 3D games with the Unity game engine. The first course in the series, The Ultimate Guide to Game Development with Unity, will cover the fundamentals of the development platform and programming in C#. Students will test their knowledge through more than 30 interactive challenges designed to reinforce the skills needed to create commercial-quality games. "Unity's success depends on the success of our developers and their ability to create rich, high-quality experiences. We are proud to partner with Udemy and give developers the tools and resources they need to realize their potential," said Jessica Lindl, global head of education at Unity Technologies, in a statement. "As the global marketplace for learning and teaching online, Udemy provides a home for developers to find the necessary courses to create with Unity."